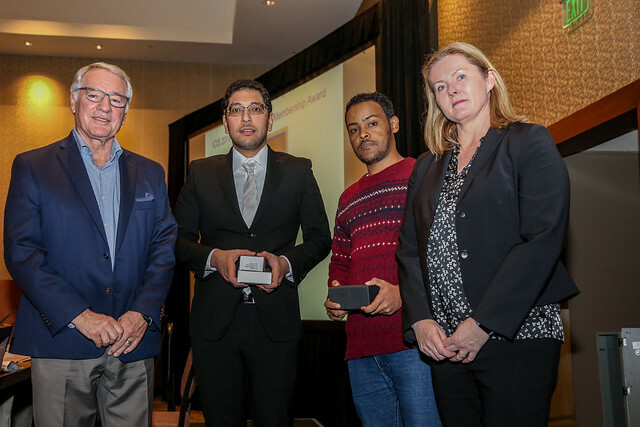 2018 Distinguished Services award was presented to two colleagues of Professor Kishimoto, Dr. Yohannes Gemechu and Dr. Hozaifa Metwally. Professor Emeritus, Tadamitsu Kishimoto, MD, PhD, is honored with the 2018 ICIS Distinguished Service award in recognition of his extraordinary contribuutions to science, teaching and drug development within the field of cytokine research. The 2018 ICIS Distinguished Service Award acknowledges Kishimoto’s career-long achievements to the field of cytokine research including his commitment to supporting the next generation of scientists as a mentor, teacher and tireless advocate for young investigators. As a pioneer in the field of cytokine research, Professor Kishimoto is responsible for transforming the cytokine field from a descriptive and phenomenological discipline to one firmly anchored in the molecular biomedical sciences. Perhaps foremost in his career, Dr. Kishimoto discovered and cloned interleukin-6 and its receptor components, IL-6Ralpha and gp130. In the course of the work, Kishimoto also defined the signal pathway including the cloning of the transcription factors NF-IL-6 and STAT3, both central factors in the action of IL-6, and discovery of the negative regulators of cytokine function, suppressors of cytokine signaling (SOCS) family. Kishimoto is also credited with description of IL-6 in the pathogenesis of cardiac myxomas, multiple myeloma, Castleman's disease, rheumatoid arthritis, Crohn's disease and juvenile idiopathic arthritis. Recognizing the importance of this pathway to human health, Kishimoto was instrumental in developing the anti-IL-6Ralpha monoclonal antibody ACTEMRA® (tocilizumab) which has provided therapeutic benefit across several auto-inflammatory diseases including rheumatoid arthritis and juvenile idiopathic arthritis. That his work has spanned from discovery to the development of an effective therapeutic highlights the breadth and depth of his accomplishments. With the awarding of the 2018 ICIS Distinguished Service Award, the Society wishes to acknowledge Dr. Kishimoto's great contributions to the field of cytokine research over many decades. Of note, he organised the Cytokine Workshop in Kobe in 1993, as President of the International Cytokine Society in 1995 (which merged with the ICIS in 2013), and as Honorary President of the ICIS meeting in Kanazawa in 2017. His contributions to the Kanazawa meeting doubled the amount of travel awards made available to Young Investigators which contributed to the success of that meeting. He continues to encourage young investigators by administering the Tadamitsu Kishimoto International Travel Award to support around 40 Japanese Society for Immunology (JSI) members presenting his/her data at an international meeting, including the ICIS Annual Cytokines meetings. Please join us on Saturday, 27 October, for the presentation of the 2018 ICIS Distinguished Service Award to Professor Tadamitsu Kishimoto.